Handsomepants is from a family of five kids. It’s always a riot when the whole family gets together and inspired me to want a large family of my own. Last year Handsomepant’s younger brother Jared got married to a lovely lady, and they both like to play video games. So when Ginger asked what kind of a quilt pattern they wanted for their wedding quilt the asked for Majora’s Mask from the game Legend of Zelda: Majora’s Mask. 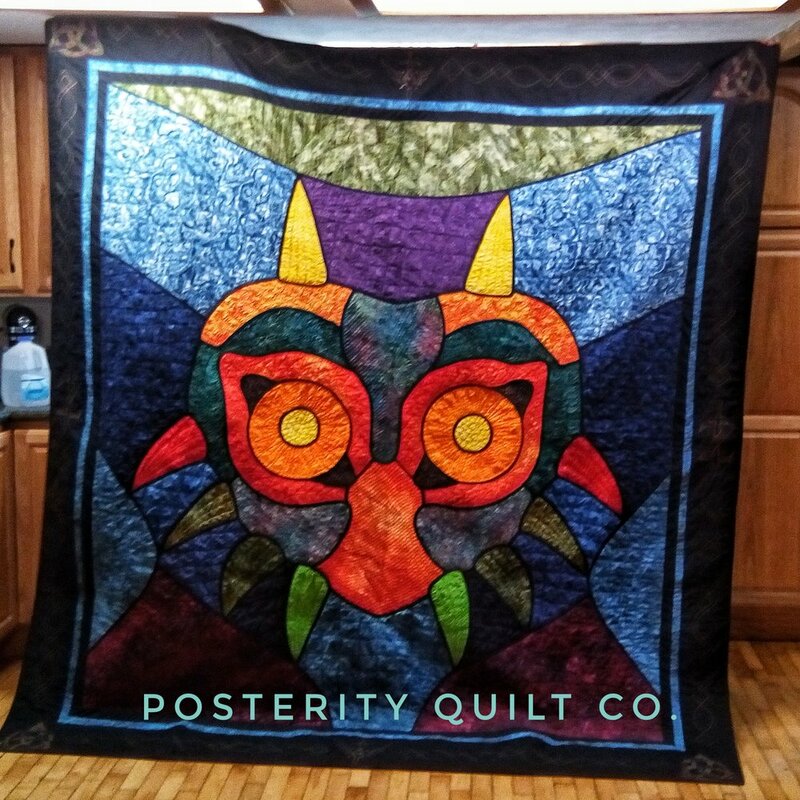 Unsure of where to find a king sized pattern of Majora’s mask, because let’s be honest it’s probably not a popular quilt pattern, Ginger turned to the internet. What she ended up doing was converting a stained glass pattern onto paper and pieced or appliqued major parts of the quilt. The mask from the game. To keep in line with the look of the stained glass, Ginger selected batik fabrics and outlined the mask with black bias tape. Each section of the quilt is quilted with a different patter, and you can see that best on the back of the quilt because Ginger matched the thread to the quilt top. I like way that patterns are highlighted ob the backing, especially in the boarders where Ginger quilted in Triforce and sword patterns. I never played the game, but Handsomepants was quite impressed at the details. I appreciate the giant carpenter’s star Ginger put on the backing. I know that the quilt took a long to make, but I think the wait was worth it!